As strange as it may sound to many of you, before this year, I never owned a Dirndl. Not even as a child. But… since I’m attending a lot more German Festivals these days, it was pointed out to me, that I would fit in better if I wore one. True enough. But I didn’t want something typically Bavarian (my family is from a different part of Germany). 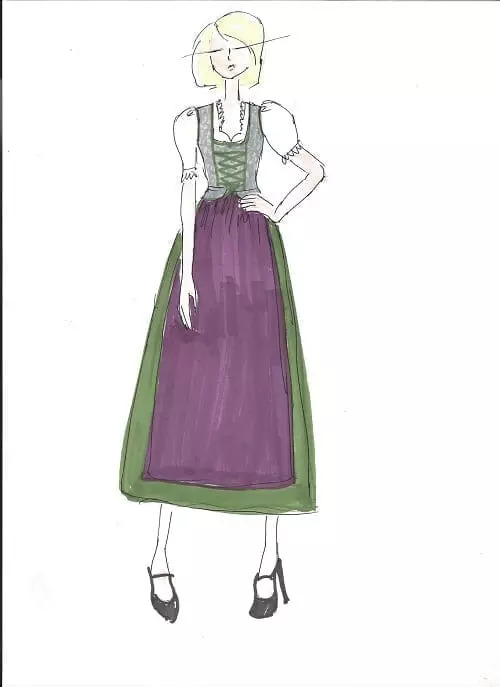 Where could I Buy a Dirndl in USA? A custom Dirndl that fit my background and personality. Without hesitation I knew! Rare Dirndl made ordering the perfect Dirndl EASY! And now I’d like to share my Rare Dirndl experience with you. Warning: Rare Dirndls Increase Confidence! My family is not from Bavaria, so a dirndl is not a traditional costume for me. 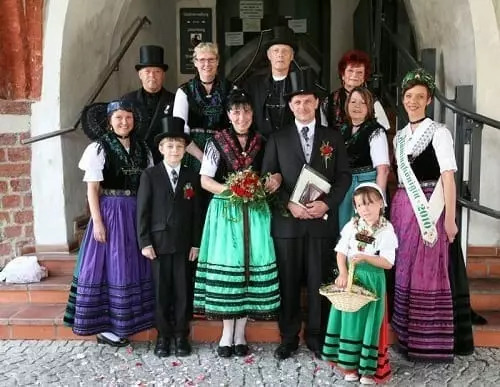 This doesn’t mean that we don’t HAVE traditions… it’s just that the Tracht is different. Not wildly so, but enough to make me feel like I wanted something not straight off the rack. Something that would reflect my mother’s Silesian heritage, my father’s Brandenburg birthplace, and my family’s North Rhine Westphalia home? 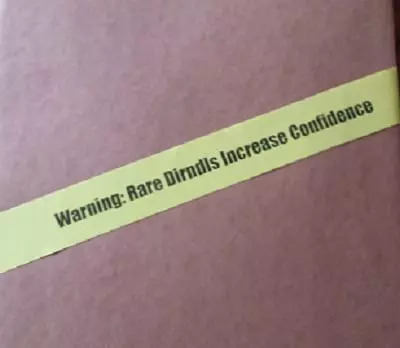 I contacted Erika Neumeyer at Rare Dirndl for help. Erika got right back to me, and her enthusiasm for the project got me all fired up! For the past few years I’ve seen posts from Erika online. Her modern take on Dirndls goes well beyond what your Oma might have worn. 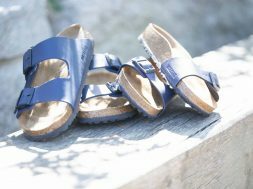 She chooses fabrics and colors that may seem out of the ordinary… but the end result is a spectacular marriage of old and new, with an edginess that fits today’s culture. 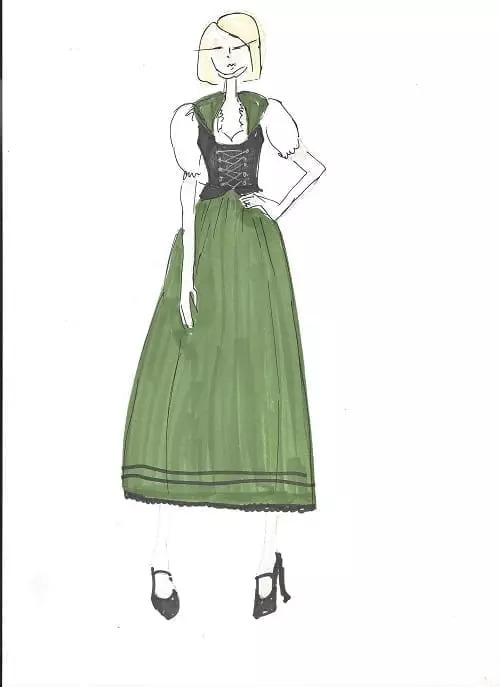 Fashion changes with the times, and I see Erika as the trendsetter who will make wearing a dirndl COOL! Our project started with loads of emails back and forth…. 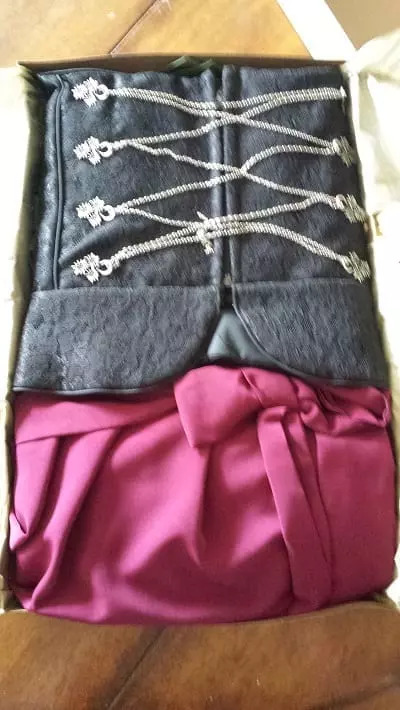 I sent photos of Tracht I found online, and photos of a dress my Aunt would wear to festivals… We discussed colors, and shape… And we talked about making it a versatile outfit that could be worn several ways. (I knew that I would be at festivals over multiple days, and I didn’t want to always look the same…. and I didn’t want to have to buy a closet full of dirndls...yet). Erika sent me a series of design sketches… her suggestion was for a skirt, vest and shawl. I chose #2…. To me a skirt and vest seemed most practical (clearly, my Oma was in my head).The primary color would be green, because Gruen ist Leben! (Green is life) I also wanted a shawl…. something to add warmth (on cold nights) and to give a nod to the Silesian and Brandenburg trachts. And then I waited… but not very long at all! Occasionally she’d send me a question… or a photo update…. We decided to add a Burgundy apron (because it’s my favorite color), and a splash of color is nice. 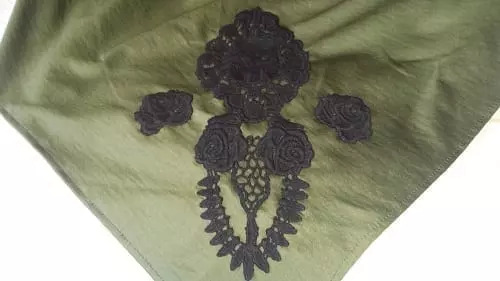 She added a beautiful piece of Rose embroidery to the shawl to reflect the roses found on Silesian Tracht. The Box got me SOOOO excited! The ultimate compliment came from the many strangers who came up to me and told me how much they loved my dirndl. Some even took photos! I can honestly say, if you want to buy a Dirndl in USA, contact Erika at Rare Dirndl! The experience was painless (well, except for the measuring bit…) and I was delighted with the outcome. Keep in mind, you definitely don’t have to make a custom order like I did. 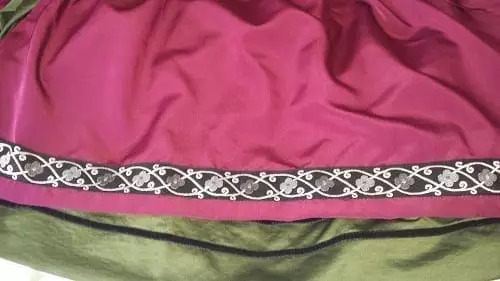 She has LOADS of beautiful Dirndl dresses, dirndl blouses, dirndl jewelry and aprons in stock at all times. 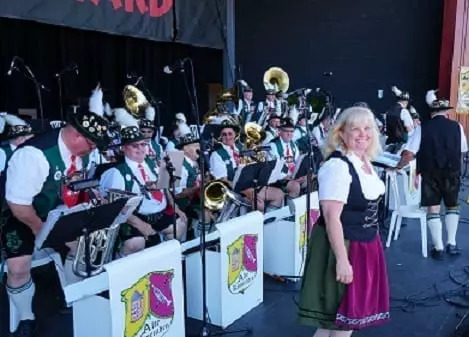 All of her Dirndl are made here in the USA! Check out the website... and be amazed. Months after contacting Erika, I finally got to meet her for the first time at Germanfest Milwaukee. Her booth was bursting with amazing Dirndls and accessories… and she was crazy busy. Everyone wanted one! And no wonder!! Her style is unmistakable, and her use of unexpected fabrics (like fur, leather, and Indian batiks) make incredible dirndls that women WANT to wear. 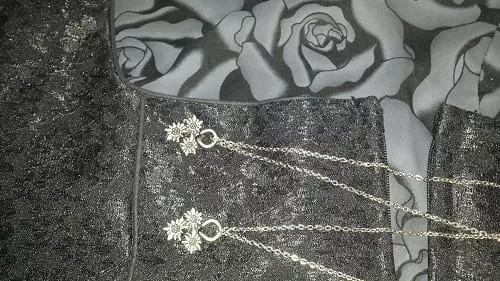 Add to that some edgy and fun jewelry, and you have a timeless look in keeping with the 21st century. 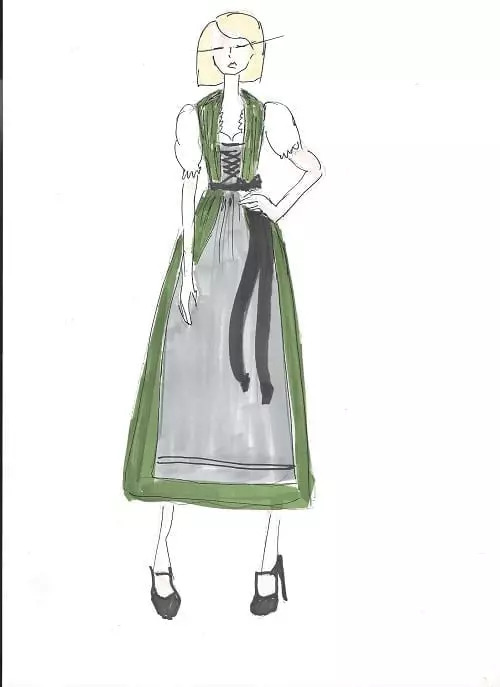 Thanks again to Erika for making me such a beautiful dirndl…. I just know she will make the perfect dirndl for you! What is a Bollenhut? 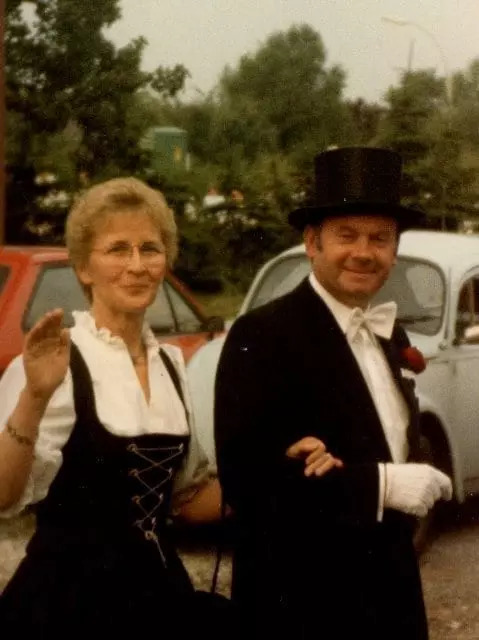 That Iconic Black Forest Tracht Hat! I want a lederhosen for women,bin von bayern and we wear women’s lederhosen. You couldn’t. A Dirndl is not German, but just Bavarian. That starts with the word “Dirndl” which is not proper German, but Bavarian dialect. 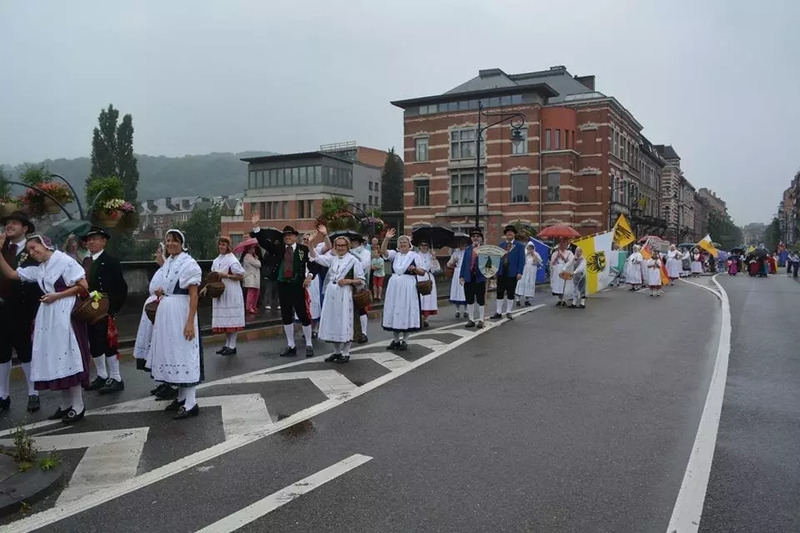 It is very regional culture, but seems to be very marketable internationally, so it’s marketed as a placeholder for the overall German culture. 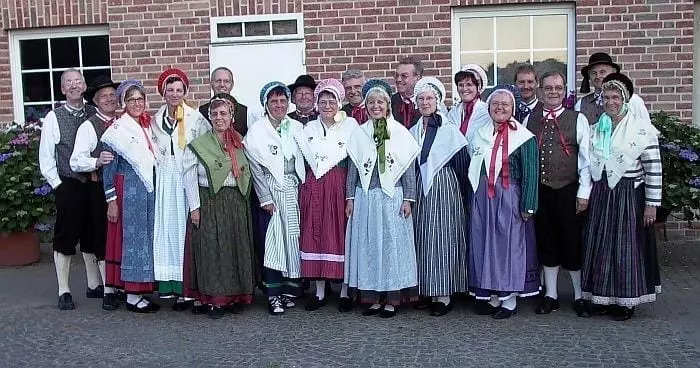 The reason why a typical German does not dress like that is because only a typical southern Bavarian does (northern Bavaria, also referred to as Franken, is different again). 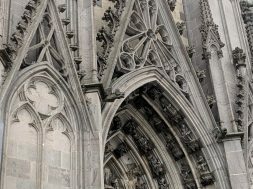 What people do not realize outside of Germany is that the country is in reality a side by side of regional cultures which up until the mid 19th century even were their own independent kingdoms separated by borders and faith (the north was protestant while the south was catholic) and they fought wars over their differences. The German nation state is younger than the US of A. Correct, I should have used the word Tracht.